HOLY COW, I spent a lot of money last month and this. A big portion of it was on travel to Vermont and Hudson ($520), but I also went pretty crazy with food ($623, in part thanks to the fact that we're moving and I'm trying to get my fill of NYC goodies before we leave) and clothing ($522, mostly because Old Navy and LL Bean both had good sales and I stocked up on some autumn items I'll certainly use in the Upper Valley—hello, brand new leather boots!) and two wedding gifts ($300). I also paid $700 in taxes a month late. Things look not great, but I'm continuing to let my accounts go into the red when I spend more than my monthly budget of $300, and I hope that will force me to go a little easier on the shopping and food next month, even as I try to enjoy my last few weeks in New York City. I did bring in some freelance money the last two months, and I should have a bit more coming in next month. I was hoping to put it all (after taxes) toward my vacation fund, which still isn't quite met, but because I went so crazy, it all went to paying my credit card bill. Yikes. Not a great feeling, but hopefully next month's freelance income can go toward fixing that. 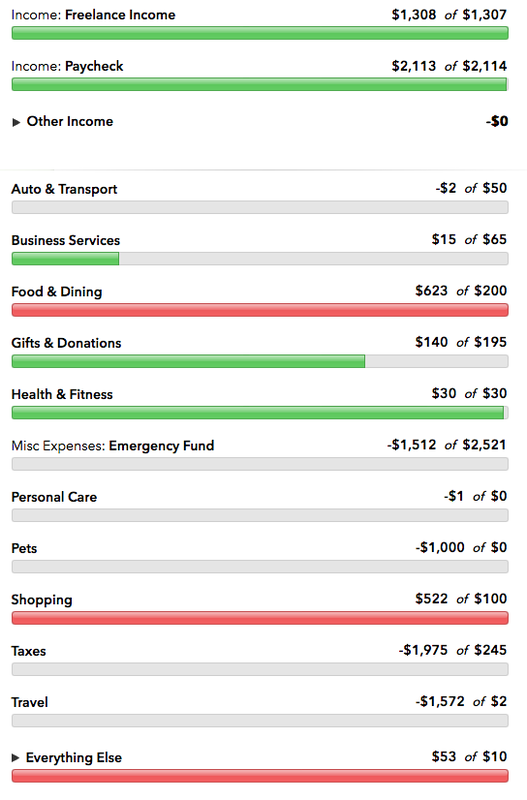 And, it's also a bit nice to see my net worth go up, even when my spending feels out of control. Thanks, automatic savings tools! I'll be honest with you, things aren't likely to get a ton better in September, because we need to put money down on an apartment, buy a car, and probably pay some moving costs up front. But, in October, I'll get a signing bonus and reimbursements for the moving costs, so hopefully that alleviates things a bit. Other than travel, moving has always been the biggest expenditure for me. It's going to be a bumpy ride, but thanks for following along with me! How's your budget going? Did you meet any exciting goals this month? Do you have any tips for buying a car that's good in the snow and won't need tons of repairs?